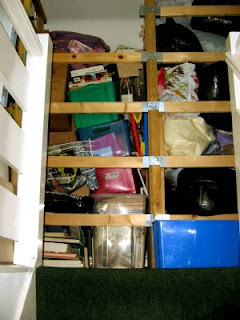 Relatively Retiring: Hoarding - the End of the Road. But........hopefully the start of a new life in someone else's collection. 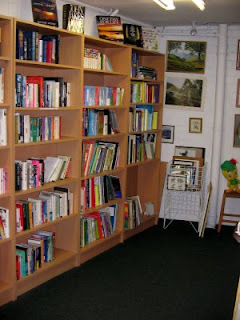 Once a week I work in a charity shop, sorting and pricing books. The books come in, some boxed, some in bags, or loosely tied with string. Maeve Binchy nestles next to Tolstoy, Thomas the Tank Engine lies down with P.D.James. Up the narrow stairs they go, into a holding bay, ready to be sorted by the handful of volunteers who also come in once a week or so. We never know what we will find. Sometimes there is a pattern. It looks as if someone has given up the linguistic struggle and a splitting carrier bag contains, 'Spanish in a Week', 'Teach Yourself Spanish', 'One Day Spanish', 'Basic Spanish in a Month','Beginners Spanish' and 'Conversational Spanish the Easy Way'. One hopes the holiday was a success. The adult offspring have left home, and someone has finally cleared their rooms. There are two boxes of Ladybird books, and a great collection of hardback Enid Blytons. The Famous Five, apparently still parentless, are roaming the countryside, spying on suspicious-looking men, and being fed enormous cholesterol-loaded cream teas by friendly farmers' wives. Darrell and Mary-Lou are still being naughty in the dormitory at Mallory Towers School, while the early edition Noddy books remain a treasure house of political incorrectness. Someone has had to sort out older treasures, perhaps from their parents' home, for in another box are some fifty-year old 'Boys' Book of Science' with many of the pictures crayonned in. The boys in these books wear knee-length grey shorts, white shirts, ties and pullovers, and when they go outside to do their experiments with string and baking powder, they wear their school caps with crests on the front. There are no girls in the science books. There are sometimes bags full of Mills and Boon Romantic Fiction. We, the volunteer sorters, like Mills and Boon books. They are small, lightweight, easy to handle and can all be put on one shelf for collectors, without having to classify them by author. They can all be priced at 45p. Easy peasy. Less easy are the big books of car maintenance for out-dated cars, the faded cookery books featuring prawn cocktail and Black Forest gateau, craft books full of ponchos and tam o' shanters in orange and lilac acrylic (see 'Beth' for more ideas) and town guides full of lovely photographs and twenty year old street plans. Collectors' items possibly - but where are the collectors? More often there is no pattern, but each bag and box gives evidence of a life. 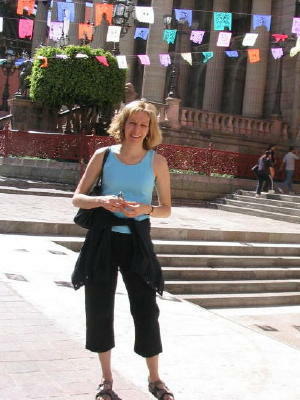 A passing interest in Feng Shui and flower arranging, and a more extensive interest in thrillers and real-life murders. Can these co-exist? Perhaps this bagful indicates the end of a relationship. Another box contains gardening books, especially about the cultivation of vegetables, several cartoon books about cats, including 'Feng Shui for Cats' which should really have been in the previous collection, and a clutch of historical romances. A more harmonious life, I like to think. Then there is the disconcerting bag full of books about weaponery, which is not as disconcerting as the small man in the anorak who comes in looking specifically for such books. I ask if he would like to leave a contact number, so that we can tell him if something on nunchaku turns up. He prefers not to leave a contact number. There is always a lovely assortment of children's books in this shop, fiction and non-fiction, all at pocket-money prices. Whenever I'm in the shop, filling shelves, I point children and their parents to the books. Much, much too often they smile politely at me and then drift across to the video and DVD collections. To the Disney shelf. Have a look at 'Zhoen's' thoughts on Princesses, and mourn with us. I do not give up on the hope that every book that has once enriched a life may go on to do its work again. Sorting takes a long time. You can see why. Oh, the joys of libraries, where I could chose my own books. Girls solving mysteries, and if not girls, then at least someone my age out adventuring. Black Beauty, biographies, Encyclopedia Brown, Beverly Cleary's Ramona, joke books, science, Arctic explorers. Thanks for suggesting the next post. Zhoen - oh yes! No Health and Safety restrictions for children in my day - in books or in real life! What a wonderful experience and I would hope the same as you in that a book has enriched a life. I often love to browse through these kinds of shops because every turn around a corner offers up and opportunity for delight! Once, I found the most precious book on birds. It was written by Len Howard, a British naturalist. One of my favorite books. Very lovely post. Thank you. I visit charity shops (or Op. shops, as they are called here) for the books. Have found such treasures. And to put your mind at rest nieces and nephews go straight to the books and come out with arms full! Love you description of the Boys annuals. I can visualize them quite clearly! Kat and HHnB: glad to see you get as much pleasure as I do, and are finding treasures. I'm so pleased to hear about the children, too. Thank you, Avus. We, along with most other charity shops, use various experts to make sure we get the best price. As you say, the defining thing is the quality, and it always seems rather sad when children's books are pristine. Must confess to an interest in feng shui and a prediliction for thrillers myself. It would seem the two can indeed go together! Yes, opportunities.... a good word for such treasure houses! mm: well that'll teach me not to pass judgements. Did you manage to find the nunchaku you were looking for? HHnB: what is the right word? Leslee - what a shame, you could have made some charity worker very happy! What did you do with them - excite the dustmen?